A simple graham cracker crumb cake baked in the microwave! Full of nuts and cinnamon, this 20 minute crumb cake couldn't be easier. Microwave butter in 2-inch-deep 2-L microwaveable round dish on HIGH 30 sec. or until melted. Stir in 1/2 cup graham crumbs, 1/3 cup sugar, nuts and 1 tsp. cinnamon. Beat eggs in large bowl with whisk until blended. Add Cool Whip, remaining graham crumbs, sugar and cinnamon; stir just until blended. Spread over crumb mixture in dish. Microwave on MEDIUM 9 to 10 min. or until cake starts to pull away from side of dish. (Top will still be slightly moist.) Place serving plate on top of dish; invert cake. Remove dish. Sprinkle any crumb topping remaining on bottom of dish over cake. Fluff crumb topping with fork. Serve warm. If your microwave does not have a turntable, turn the dish after 5 min. in the final microwave cooking step. 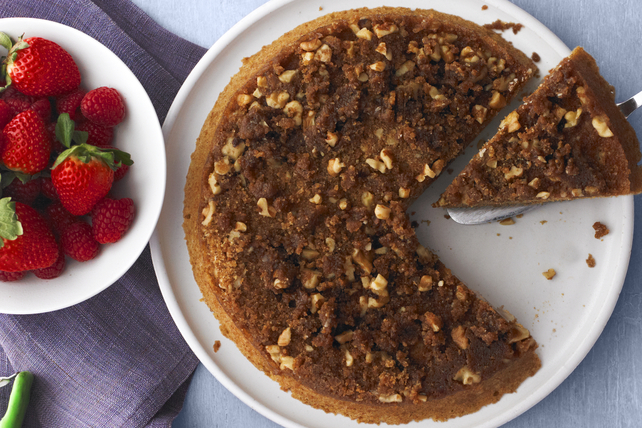 Prepare cake in 9-inch deep-dish microwaveable pie plate.